According to Margarete Klein and Claudia Major, the future of NATO-Russia relations is up in the air. As they see it, three scenarios are possible: 1) confrontation with strong potential for escalation; contained confrontation; and a pragmatic partnership to tackle shared concerns. The relationship between Russia and NATO is undergoing its deepest crisis since the end of the Cold War. The target set in 2010 of establishing a “strategic partnership” based on mutual trust, realisation of shared interests and respect for agreed principles such as the Charter of Paris for a New Europe (1990) has been abandoned for the foreseeable future. This deep disruption is reflected in the suspension of dialogue and cooperation structures: In April 2014, in response to Russia’s illegal annexation of Crimea and the destabilisation of eastern Ukraine, NATO stopped civilian and military cooperation in the NATO-Russia Council (NRC). Previously this had extended from confidence-building measures, such as a dialogue on defence doctrines, to practical cooperation, for example training counter-narcotics personnel in Afghanistan. Despite its fundamental criticisms, NATO is upholding the possibility of political dialogue with Moscow. In April 2014 it decided to keep channels open at ambassadorial level. In fact, however, the lines have gone dead here too, with the NRC convening just once since that date. Even more serious than the cessation of practical cooperation is the massive loss of trust and the revival of traditional threat perceptions, above all in certain central and eastern European countries and in parts of the Russian leadership. Moscow is no longer a partner for NATO. The Alliance has responded to Russia’s actions with its deepest military adaptation since the end of the Cold War, with the goal of considerably strengthening and adapting its defence capabilities. Collective defence is once again a core concern. The Readiness Action Plan (RAP), adopted at the Wales Summit 2014 to steer NATO’s adaptation, outlines immediate assurance and long-term adaptation measures. By, for example, stepping up exercises and intensifying air-space surveillance, the Alliance reassures concerned members that they can rely on NATO’s promise of collective defence. Adaptation involves the Alliance enhancing its readiness and responsiveness, for example through a new rapid reaction force (VJTF) and the establishment of NATO Force Integration Units in eastern Europe. NATO regards these as defensive measures in accord with the NATO-Russia Founding Act (1997), in which both sides agreed principles for promoting confidence and cooperation. Moscow, on the other hand, regards such moves as evidence of NATO’s aggressive, expansionist character. In 2014 and 2015 it again expanded military capacities in its Western Military District, which adjoins the NATO members Norway, Poland and the Baltic states: exercises were intensified and weapons systems modernised; Russia is also planning to strengthen its ground forces there and deploy more modern anti-aircraft systems. Following the annexation of Cri-mea, moreover, restrictions on modernising the Russian Black Sea fleet fell away. Moscow also uses demonstrations of military might as sabre-rattling: the number of Russian aircraft flying close to NATO air-space increased significantly during the past year, and the Kremlin’s nuclear threats also give cause for concern. The latter were underlined in December 2014 and March 2015, when nuclear-capable Iskander short-range missiles were deployed to Kalinin-grad for exercises. What this amounts to is the return of the security dilemma – which had appeared overcome – where actions that one side regards as defensive are interpreted by the other as offensive, therefore leading to escalation. The consequence is a dangerous spiral of action and reaction. 1. Confrontation with strong potential for escalation. Lack of trust, inadequate dialogue and military build-up generate great instability. Tensions can escalate militarily, either accidentally as the result of misinterpretations or deliberately whipped up, for example for domestic political reasons. There are two particular dangers: firstly, that both sides possess nuclear weapons. Secondly, Moscow’s hybrid warfare offers many possibilities for misinterpretation in its broad grey zone between war and peace, military and non-military means, regular and irregular actors. The use of force can neither be clearly attributed to one party nor does it possess a distinct military character. Here too, there is neither aspiration nor hope to resolve the overarching conflict about the institutions and principles of the euro-Atlantic security order. But both sides work to avoid a military escalation, for example with the assistance of transparency, confidence-building measures and bilateral arrangements. Where shared interests exist, ad hoc cooperation is possible. The conflict persists but the actors are willing to address it in selected fields. This comes with an intensified, long-term and institutionalised cooperation – characterised, however, by rivalry. The likelihood of military escalation is smaller and the reliability greater. Yet, unlike in a strategic partnership, there is no shared bedrock of values and no vision for the relationship. Which scenario will prevail in the longer term will depend on internal developments in Russia and NATO, as well as on external factors. The domestic political situation is currently promoting a confrontative stance on the part of Russia’s leadership. Since the beginning of Vladimir Putin’s third term as president in 2012, Russia has increasingly distanced itself from the West, above all for domestic political reasons. When the previous basis of its legitimacy–economic success and the ability to generate prosperity–began to crumble (even before the Ukraine crisis) the Kremlin instead mobilized a conglomerate of ideologies combining nationalism, harking back to past greatness and normative distancing from the “decadent” West. In foreign policy this is reflected in stiffening hegemonic aspirations in the post-Soviet space and a turn to China. For the moment Putin can still rely on strong public support and effective instruments of propaganda and repression. But the slow pace of economic reforms, the repercussions of Western sanctions and the low oil price have the potential to undermine the regime’s stability. This could tempt Moscow to step up its anti-Western rhetoric and provocative demonstrations of military power, such as major manoeuvres on the Western border or stoking the Ukraine conflict–possibly in the run-up to the September 2016 Duma elections, just a few weeks before the NATO summit, or before the presidential elections scheduled for spring 2018. With the incentives including economic necessity and the costs of a junior partnership with China, a rapprochement with the West is not out of the question. But for that to happen, the influence of the hardliners would have to shrink and the political weight of moderate realists and liberals increase. The 2016 NATO Summit in Warsaw could temporarily aggravate the confrontation. The Summit is due to announce the completion of the strategic realignment initiated in Wales. There may also be discussion of further adaptation steps, as demanded in particular by the host Poland. And the agenda could also include items that Moscow traditionally criticises, such as enlargement (with the expected invitation to Montenegro) or advances in missile defence. The decisive factor will be whether NATO can maintain its united front despite the existence of different positions. Although all the allies vehemently criticise Moscow’s actions, certain central and eastern European countries feel directly threatened, whereas others do not regard Russia as their main security problem. France is more concerned about instability on NATO’s southern flank. Opinions consequently diverge about how far NATO’s military adaptation should go and how strongly it should be directed eastwards. Some allies, above all in eastern Europe, largely reject dialogue with Moscow, while others, such as Germany, wish to make use of the dialogue channels, for example by calling a meeting of the NRC. Developments outside of NATO and Russia could potentially positively influence the relationship. Any defusing of the conflict in Ukraine could pave the way for a thaw in relations between NATO and Russia. This could result from successful crisis diplomacy, or from political change in Ukraine or Russia. External risks such as Islamic extremism can also create temporary incentives for NATO-Russia cooperation. Should the security situation in Afghanistan and its central Asian neighbours deteriorate, it is unlikely that NATO would wish to become substantially involved again (if it was even in a position to after refocusing on collective defence).That could lead Russia to assume a growing active security role with NATO’s approval. On the other hand, a flare-up of ethno-territorial conflicts in the post-Soviets pace, for example in Nagorno-Karabakh, could burden the relationship. The same applies to “colour revolutions”, which Moscow views as a form of Western warfare. The fundamental conflict between NATO and Russia currently appears irresolvable, the relationship in tatters. A longer phase of tension and relative instability must therefore be expected. In order to prevent military escalation and bolster stability in the Euro-Atlantic area, current efforts should be directed towards avoiding both escalation (scenario 1) and mere containment of the confrontation (scenario 2), and working instead towards a pragmatic partnership (scenario 3). That does not mean watering down the normative acquis of the Paris Charter. Sovereignty, territorial integrity and free choice of alliance are non-negotiable for NATO states. In order to avoid the Kremlin interpreting offers of dialogue and practical cooperation as approval of its actions in Ukraine, any moves towards pragmatic partnership must wait until Russia has made substantial progress with implementing Minsk II. Within NATO, such a partnership can only be realised if collective defence is guaranteed through credible deterrence, defence and resilience. The once so dense network of contacts is not going to be reactivated in the foreseeable future – but precisely in times of crisis, communication must be maintained in order to keep possibilities of deescalation open. 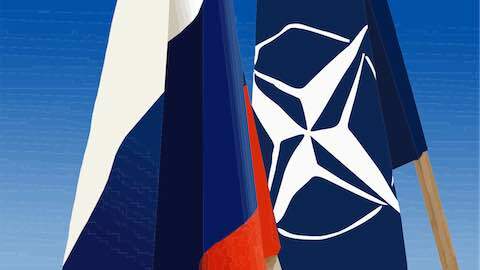 In the short term informal channels should be utilised, such as the meetings between NATO Secretary-General Jens Stoltenberg and the Russian ambassador to NATO, Aleksandr Grushko or Russian Foreign Minister Sergey Lavrov. This could be backed up by track-two initiatives to explore the room for negotiations. Should there be substantial progress on Minsk II, it would be advisable to gradually resume the NRC dialogue formats. Even if the political blockade continues, practical technical steps can be agreed to (1) avoid unintentional military escalation and (2) revive classical arms control. The former would include making use of the military-level crisis contact mechanism proposed by German Foreign Minister Frank-Walter Steinmeier. An agreement between Moscow and NATO on rules of behaviour for the safety of air and maritime encounters would also be useful. In the second area, the goal must be to stem the erosion of existing arms control agreements. In the first place that means preserving the Vienna Document, as the most important current OSCE package on conventional arms control. If the relationship improves, practical cooperation in the NRC can be resumed step by step. Contacts at military level could first be activated in politically uncontested areas of immediate benefit to both sides, such as maritime search and rescue. Here the Alliance could draw on the experiences of individual members such as Norway.